Follow Friday + Nicki's Personal Updates: My First 7 Days of Dr. Whitney Bowe's 21-Day Skin Detox Plan! Quinoa (/ˈkiːnoʊ.ə/, from Quechua kinwa or kinuwa) is a species of the goosefoot genus (Chenopodium quinoa), a grain crop grown primarily for its edible seeds. It is a pseudocereal, similar in some respects to buckwheat, rather than a true cereal, as it is not a member of the true grass family. 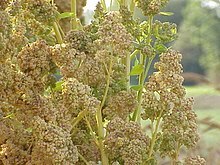 As a chenopod, quinoa is closely related to species such as beetroots, spinach and tumbleweeds. As a member of the Amaranthaceae family, it is related to and resembles amaranth, which is also a pseudocereal. After harvest, the seeds must be processed to remove the coating containing the bitter-tasting saponins. The seeds are in general cooked the same way as rice and can be used in a wide range of dishes. The leaves are eaten as a leaf vegetable, much like amaranth, but commercial availability of quinoa greens is limited. The nutrient composition is favourable compared with common cereals. Quinoa seeds contain essential amino acids like lysine and acceptable quantities of calcium, phosphorus, and iron. It is high in protein, and is tolerant of dry soil. The Food and Agriculture Organization of the United Nations (FAO) declared 2013 to be the International Year of Quinoa.Chenopodium formosanum is a Taiwanese variant of Red quinoa that is endemic to Taiwan, and is widely grown in Eastern and Southern Taiwanese Aboriginal cultures. Quinoa originated in the Andean region of Peru, Bolivia, Ecuador, Colombia and Chile, and was domesticated 3,000 to 4,000 years ago for human consumption in the Lake Titicaca basin, though archaeological evidence shows a non-domesticated association with pastoral herding some 5,200 to 7,000 years ago. Similar Chenopodium species, such as pitseed goosefoot (Chenopodium berlandieri) and fat hen (Chenopodium album), were grown and domesticated in North America as part of the Eastern Agricultural Complex before maize agriculture became popular. Fat hen, which has a widespread distribution in the Northern Hemisphere, produces edible seeds and greens much like quinoa, but in smaller quantities.